It’s been called the most successful spec house in Greenwich, Connecticut. The 14.49 acre property, previously owned by actor George C. Scott, sold in 2005 for $8,725,000. Just six years later, the redeveloped property sold for $32,500,000. Paul Stephan Marchese Architects designed a substantial 14,000 square foot award-winning manor on the estate complete with subterranean garaging for twelve vehicles, extensive gardens, entertaining patios and a pool with charming pool house. It was built by Connecticut builder Hobbs, Inc., finishing in 2011. The interiors include an elegant floating staircase with ebonized mahogany railing and treads, a two-storey breakfast room with Honduran mahogany and leaded glass windows, a soaring 22 foot high family room with 17 foot x 20 foot wide windows with motorized transoms and an antique English pine bar with oak flooring in a chevron pattern. Realtor.com estimates the annual taxes at $219,690. 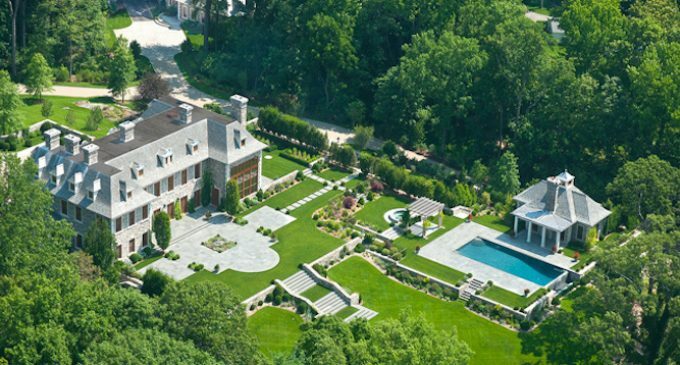 Scroll down to take a tour inside this spectacular Greenwich manor. Photography by Phillip Ennis.